WORLD GAY RODEO FINALS – THE GREATEST SHOW ON DIRT! People Ask Why a Gay Rodeo? It’s a huge surprise to many people that there is such a thing as a “Gay Rodeo.” The idea of being gay and being a cowboy/girl don’t really go together in most folks eyes. But gurrrllll, please… some of the butchest cowboys in rodeo are gay! In the beginning of gay rodeo in 1975 when Emperor 1 of Reno, Phil Ragsdale just wanted to help raise money for a local senior citizens Thanksgiving Day feed, his idea was to host a gay rodeo to raise necessary funds and use that opportunity to help overcome the walls of prejudice. With hard work and perseverance, he was finally able to host the first-ever gay rodeo in 1976. Initially, it was a way to raise money but also show that our American western heritage is still part of many gay people’s lives. It also grew into a huge party but also a safe place for many gay Cowboys & Cowgirls that were still being shown prejudice in many small towns across the country. They could simply relax, just be themselves, and not fear judgment or discrimination for being gay. 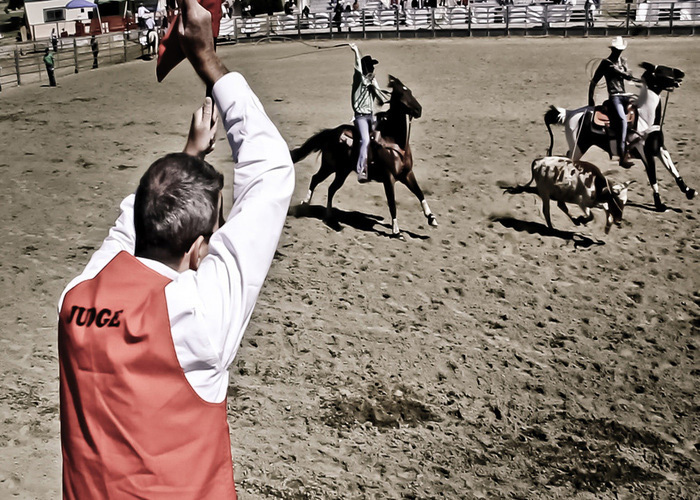 Many ask how a gay rodeo is any different than any other rodeo. One of the things we discussed in a previous blog is how we structure our Rodeo Royalty. In addition to Royalty, Gay rodeo offers many of the same events such as, roping, bull riding, Bronc riding and barrel racing. The biggest difference between mainstream rodeo and Gay rodeo is that men and women compete in all the same events. There aren’t some events that are for men only or women only. We have separate men’s and women’s categories. But you can see women ropers and women bull riders. Another point of true distinction when we think about Gay rodeo is our “Camp Events.” Many early ranch rodeos had some type of campy events like wild milk cow milking and steer decorating that you still see today in ranch rodeos across the country. And in similar fashion, the early days of Gay rodeo also had wild milk cow milking, too, but they quickly found out how dangerous it could be with many serious injuries. So, the Gay rodeo organizers of the day soon came up with other fun competition events that anyone regardless of their gender or skill level could do without owning a horse or being daring enough to try more dangerous rough stock events like bull or bronc riding. IGRA adopted their own camp events like goat dressing that takes a team of two running down an arena with a pair of men’s tighty whitey underwear to a goat, staked on a rope, to put the underwear on it and run back with the fastest time winning the event. We also have Steer decorating that you have a team of two with a steer in a chute with a rope around its horns and one team member has a hold of the rope. The other team member has a ribbon that once the chute gate opens and the steer comes out they must time the ribbon around the tail and once again fastest time wins. Then comes one of our favorite events that is always a crowd pleaser… the Wild Drag Race! You have a team of three that must consist of a man a woman and the third member can be either male or female but must be in drag… women’s clothes and a wig. Some team members go all out with very outlandish costumes that get the crowds cheering. Once again you have a steer on a rope with it attached to a halter on its head, inside a chute. The woman must start with the rope at a 10-foot line the guy at a 20-foot line and the drag at a 30 foot line. They must maneuver the steer to the 30-foot line and the drag must mount the steer and ride it back across the line. Much fun and mayhem is always had as well as the danger factor of a wild steer on a rope with a drag queen a top. Those are just some of the differences of a gay rodeo and mainstream rodeos. Something else we’re really proud of, is our rodeo family at Gay rodeos. Everyone is, indeed, family and you don’t always find that at other rodeos. The camaraderie, openness, non-judging, and welcoming nature makes Gay rodeo a fun, exciting, and comfortable place to be for contestants AND spectators! We are all there to rodeo and we want to win but most of all we just want a sense of belonging to something that goes much deeper than a rodeo. Come see us at the 2017 World Gay Rodeo Finals in Albuquerque, NM – Oct 20-22. You can compete. You can volunteer. You can sit in the stands and enjoy the show. Whatever you do, you will have a blast at the Greatest Show on Dirt! !